On October 18, 2016, the Office of Black Male Engagement (OBME) announced the establishment of the Mayor’s Commission of African American Males (MCAAM) for the City of Philadelphia. 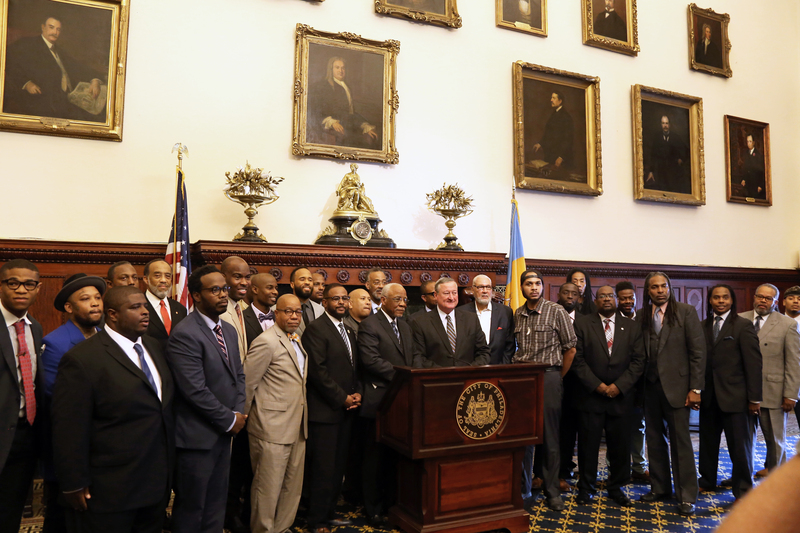 MCAAM will study the varying and diverse conditions of Black men in Philadelphia and provide yearly reports and recommendations to the Mayor, City Council, and relevant Organizations on how to affect positive outcomes for Black men and boys. MCAAM is housed under the Mayors’ Office of Public Engagement (OPE), led by Director, Ajeenah Amir and will be managed by the Mayors’ Office of Black Male Engagement (OBME), a branch of OPE under the direction of Jack Drummond. “The work of MCAAM will be driven by the urgency to create policy that can improve the lives of African American men in Philadelphia, but also be a way for their stories to be shared and amplified,” said Dr. Nina Ahmad. “While this commission is comprised of African American men, the diversity of their lives – age, sexual orientation, careers, education – is a strength and an asset to the city,” said Jack Drummond. MCAAM membership is comprised of 28 individuals appointed by the Mayor and includes representatives of government, business, education, labor, health and civic organizations. MCAAM is constituted as a permanent commission by way of a voter referendum in April 2016. Joel Austin, Founder, President & CEO, Daddy University, Inc.
Dr. W. Wilson Goode, President, and CEO, Amachi, Inc.
Bilal Qayyum, President and Executive Director, Father’s Day Rally Committee, Inc.
Have a question about the MCAAM? Contact Office of Black Male Engagement Director, Jack Drummond via email at jack.drummond@phila.gov or call (215) 686.0332. The Mayor’s Commission on African American Males recommends the inclusion of at least two African American males on the School Board of Philadelphia. Philadelphia has the third largest African American population in the nation and one of the highest concentrations of African American males among large American cities (United States Census, 2011). The School District of Philadelphia reflects these trends with 48 percent of all students identifying as African American and nearly half identifying as African American males (School District of Philadelphia, 2017). These items considered, Philadelphia is on the verge of allowing inequitable representation of African American males to take hold of the City’s school board. At current, only two of the 27 nominees for Philadelphia School Board membership are African American males. This equates to a dismal seven percent makeup of the pool of nominees in a City where African American boys make up nearly 25 percent of the students in Philadelphia public school classrooms. If even just one of the nominees is excluded from membership on the Board, it will equate to more than a 50 percent underrepresentation of African American males on the Board. The near exclusion of African American males from the Philadelphia School Board is disheartening and threatens to continue a trend of overlooking needs specific to the African American male experience in education. Needs that include addressing the overrepresentation of African American males in classrooms for students with learning disabilities, in dropouts and the resulting overrepresentation in Philadelphia jails and state penitentiaries may be underserved simply due to a lack of advocates (Waters, 2015; Wolfers, Leonhardt, & Quealy, 2015). At a figure of about 30,000, African American male Philadelphians are currently completing jail sentences at numbers resemblant of the number of degree holders among this group. Our inability to meet the needs of African American male students in Philadelphia public schools continues to serve as a factor in this phenomena. To that end, equitable representation for African American males through the Philadelphia School Board is bigger than education. Our ability to adequately serve African American male students within our school district directly impacts the social, economic, physical, and mental well being for nearly a quarter of our city. Indirectly, our ability to accomplish this task impacts us all. The height of what’s at stake is beyond words. The potential for a maintained school-to-prison and school-to-morgue pipeline among this group speaks volumes. A lack of equitable representation for the City’s African American males on the Philadelphia School Board will speak louder.